The European beaver is to be reintroduced to Scotland for the first time in more than 400 years, the Scottish Government has announced. Environment Minister Michael Russell has given the go-ahead for up to four beaver families to be released in Knapdale, Argyll, on a trial basis. The beavers will be caught in Norway and released in spring 2009. Mr Russell said: "This is an exciting development for wildlife enthusiasts all over Scotland and beyond." 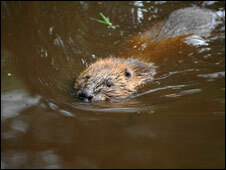 The beavers, which will be captured in autumn 2008, will be put into quarantine for six months before three to four families are released. 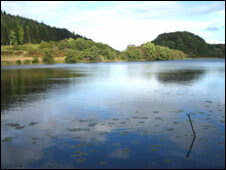 Five lochs have been proposed for the release. This will be the first-ever formal reintroduction of a native mammal into the wild in the UK. The trial will be run over five years by the Scottish Wildlife Trust and the Royal Zoological Society of Scotland, with Scottish Natural Heritage (SNH) monitoring the project. Mr Russell added: "The beaver was hunted to extinction in this country in the 16th Century and I am delighted that this wonderful species will be making a comeback. "They are charismatic, resourceful little mammals and I fully expect their reappearance in Knapdale to draw tourists from around the British Isles and even further afield. "Other parts of Europe, with a similar landscape to Scotland, have reintroduced beavers and evidence has shown that they can also have positive ecological benefits, such as creating and maintaining a habitat hospitable to other species." Scottish Natural Heritage will closely monitor the progress of the beavers over the next five years to consider the impact on the local environment and economy before any decision on a wider reintroduction. Professor Colin Galbraith, director of policy for SNH, said: "The decision is excellent news. For the first time we will have the opportunity to see how beavers fit into the Scottish countryside in a planned and managed trial. "No other beaver reintroduction project in Europe has gone through such a long, and thorough, process of preparation, assessment and examination." Prof Galbraith added that although beavers had been spotted in the wild in isolated cases, they had usually been caught and returned to zoos. Allan Bantick, chairman of the Scottish Beaver Trial Steering Group, said it was a "historic moment" for wildlife conservation. "By bringing these useful creatures back to their native environment we will have the chance to restore a missing part of our wetland ecosystems and re-establish much needed natural processes," he said. David Windmill, chief executive of the Royal Zoological Society of Scotland, said: "It is a strong and visible sign of the Scottish Government's commitment to carrying out conservation in Scotland and re-building our depleted biodiversity." Simon Milne, chief executive of the Scottish Wildlife Trust, said the challenge was now for the licence holders to raise funds for the project.